The ALEX (Argonne Liquid metal EXperiment) facility is designed to house liquid metal systems for experimental research in various areas including, but not limited to, nuclear physics, material science, and nuclear engineering. Metal Containment for liquid alkali metal systems at ALEX — We provide solid expertise in liquid metal technologies. The ALEX facility has 2 large, metal containments (C-1 and C-2) and one small containment (SC-1) inside which liquid alkali metal systems can be safely operated. There is a scrubber connected to those containments for handling large amounts of caustic smoke that could be generated in case of an alkali metal leak or fire while keeping the smoke in those containments to minimize the effects of such an event to the outside environments. The ALEX staff have expertise in liquid metal technologies based on their long experience with handling liquid metals. Also the Argonne National Laboratory Fire Department staff on site are specially trained to deal with alkali metal fires, an additional unique asset. The ALEX facility is located in the west end of building 370, a large high bay and general-purpose laboratory building. The ALEX facility was constructed in late 1984. ALEX was originally related to Magneto-Hydro-Dynamics (MHD) studies in fusion reactor design. A 400 liter, 4 inch piping loop initially filled with NaK, later converted to Li was operated for basic MHD research. The fusion-related work has been inactive since CY 1996 and the 400-liter loop has been decommissioned. Liquid lithium has recently received significant interest as a possible way to remove heat from high-energy beams incident on charge strippers or targets for large particle accelerators that are expected to come on line soon. Because of the existing alkali metal handling and safety systems at ALEX, and the liquid metal technology experience base built up by NE staff, the ANL Physics Division has requested the assistance of NE staff, and the use of the ALEX facility, in developing liquid lithium systems for high power accelerator applications. As a result, a windowless liquid lithium target system and a windowless liquid lithium stripper system have been built and tested at the ALEX facility. Another active liquid metal work at the ALEX is liquid sodium related technologies for nuclear reactor applications. In sodium cooled fast reactor applications, use of a compact diffusion-bonded heat exchanger (HX) with a few mm channel size has been proposed to eliminate the potential sodium-water reactions in case of a leak in the secondary system. Reliable data concerning how large sodium cooling channels need to be to avoid plugging by impurities over a reasonable time interval are lacking. Also lacking are the effects of freezing/melting of sodium in such a HX on its structure. 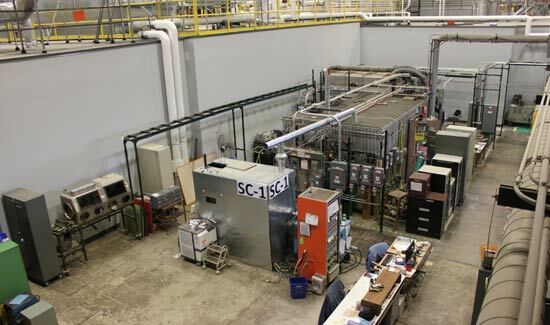 Again, due to the existing alkali metal handling and safety systems, and the available liquid metal technologies at the ALEX facility, a small scale sodium plugging loop and sodium freeze/melt apparatus have been constructed at the ALEX facility. Also for testing various advanced structural materials in sodium environments at high temperatures up to ∼700°C, small sodium loops have been constructed at the ALEX facility. Each loop contains specimen exposure vessel(s) and a cold trap with EM pump(s) and flow meter(s) to circulate the sodium and maintain the oxygen level in the sodium low (∼ppm range) as well as to replenish the sodium in the specimen exposure vessel(s). 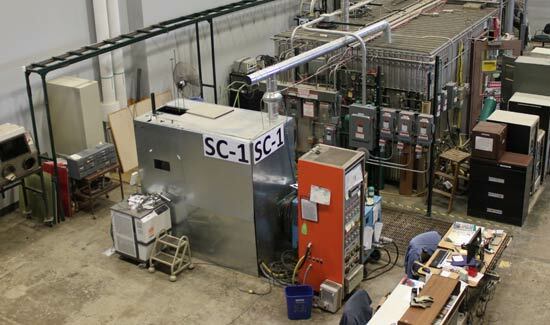 These vessels provide high temperature sodium environments for the compatibility testing of advanced materials.